On Wednesday, 4th July 1325BC, in Crete, one Icarus, son of Daedalis tried to fly but instead plummeted to the sea. His body has been washed ashore. Icarus was the son of Daedalis, who built the Labyrinth for King Minos. Both Icarus and his father were in prison, having been found guilty of insulting the King. They decided to escape by air. As they took off you could hear the people of Crete jeering and screaming with joy. Daedalis cautioned Icarus not to go near the sun because the wax would melt and he would fall to his death. Unfortunately, Icarus did not do what his father told him. Local fishermen saw him falling into the sea with his wings on fire. They reported that his face had turned from a pale colour to a smoky black. The King has also witnessed Icarus’ fall. He told us he had thought it was an eagle. He confirmed that he would not put Daedalis in prison because he was well entertained and he wanted a pair of the wings. Icarus was buried on the spot where he died. In memory of his flight, the sea around Crete was named the Icarian Sea. In 1010AD, in the town of Malmesbury, Eilmer, a monk of Malmesbury Abbey decided he would take a plunge. His mission was to see if he could fly. Eilmer waxed together some bird feathers and strapped them to his arms. He then headed for the spire of the abbey and ran off the top. He glided through the air for 200 metres and then he came hurtling down and crashed to the ground. He broke both his legs. We also interview Eilmer’s father. He said Eilmer was quite foolish but he was also helpful to the world of science, and he would always love him. People in town say that Eilmer will be remembered forever.Local scientists say they are working on a flying suit based on Eilmer’s one. On 6th May, 1937, the enormous Hindenburg burst into flames. Thirty six (36) people died in the explosion. The Hindenburg was a zeppelin, a big balloon, filled with gas to keep it floating in the sky. It was a passenger air ship, built in the same year it exploded (1937). It carried ninety seven (97) people on board. 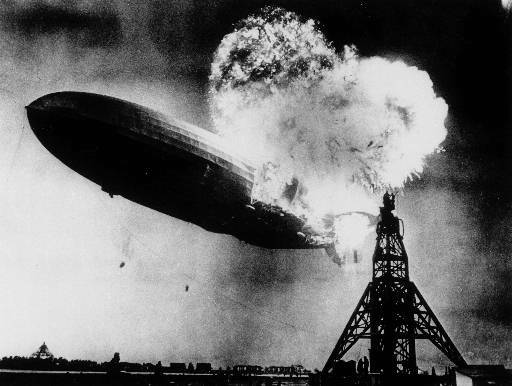 The Hindenburg was approximately 2m away from its landing point, Lakehurst Naval Air Station, New Jersey, USA, when it caught fire and exploded. One of the engineers who built The Hindenburg said, “We were richer than riches. Now we have to find out what caused the fire. Scientists speculate that the explosion was caused by people smoking onboard as a result of which helium (the flammable gas used to make the ship float) caught fire. The first airplane was created and flown by the Wright Brothers, Wilbur and Oville. Both brothers attempted to fly it in a field in England, on 17th December 1903. Oville Wright managed to keep the plane in the air for 12 seconds, his brother, Wilbur, for less than a second before it crashed. We spoke to Oville Wright after the event. He told us he was thrilled beyond words. “I felt like a bird gliding in the air. People below looked tiny. It was amazing!” Oville said. BOEING 747 CRASHES DUE TO ERROR! Fifty-nine people dead after Lufthansa 540 (Boeing 747) crashed at Kenyatta International Airport, Nairobi, Kenya, Africa, on 20th November 1974. The Lufthansa flight 540 was on a three-way trip. It started in Frankfurt and it was meant to finish its journey in Johannesburg. It was trying to take off in thick fog in the early hours of the morning, which, some may argue, was the reason of the crash, but the main reason was that the leading edge slats were left in a retracted position as a result of which the wing flaps stayed up. The flight had been carrying 157 people: 140 international passengers and 17 crew. We interviewed the co-pilot who told us that as they came falling down, the passengers started to scream. The plane interacted with the ground 114m away from where it took off and erupted into flames on contact.